How do you choose the best credit card for your lifestyle? Everyone has different spending habits, so the best credit card for you might not necessarily be the most suitable for me. As such, personalization is key. With the growing popularity of cashback credit cards, many banks and card companies are now releasing extremely competitive cards. But with more choices come more headache as well, especially when each card comes with different cashback limits and spending requirements across various categories. If you're looking for a cashback card with no caps and no hassled spending requirements, there are only 2 credit cards in the Singapore market which meet this criteria - Standard Chartered's Unlimited Cashback and the American Express True Cashback. How do they stack up among each other? There’s little difference in the benefits between both, except that the AMEX card may not be as readily accepted by some merchants. Ever wondered which card is best for your big ticket item (one-off) which you don't expect to repeat every month? Get 3% on your first six months (for up to $5000 spend), and 1.5% unlimited cashback after with no cap. Given that there is no minimum spend, you don't have to feel obliged to spend consistently on this card every single month - just pay for that refrigerator and not worry until your next big ticket item! Otherwise, as a daily use card, it also works for those who can't be bothered to remember which card is best for which category as the the 1.5% cashback rate is flat across all types of spend. No cashback cap. No minimum spend. There are only 2 credit cards in the market which do not have a cap on their maximum cashback, and the Standard Chartered Unlimited Cashback Card is one of them. The 1.5% cashback rate is flat across all categories, so you don’t have to wreck your brains figuring out what or when to swipe your card in order to get a decent cashback rate. If you're too busy (or lazy) to be fussed about cashback limits and requirements on the different spending habits, this is a good card for those preferring something with no requirements and caps. 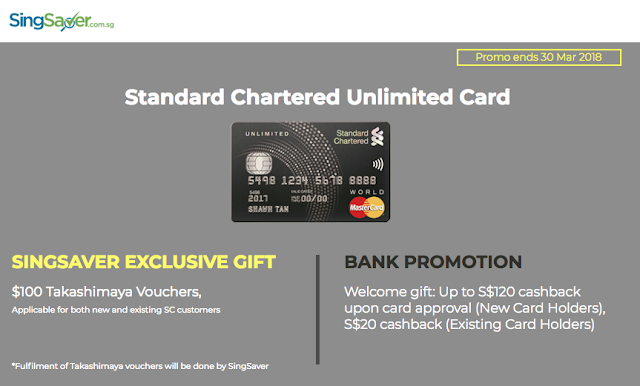 For those keen to get this, I've partnered with SingSaver for an exclusive gift of cash vouchers on top of the bank's welcome gift when you've successfully applied for the card. This promo is valid for BOTH new and existing customers! You can click here to redeem the promo, have fun! P.S. This is a post in collaboration with SingSaver, but all opinions are my own. I've also been promoting this card since 2017, together with the other cashback cards recommended in the Cashback Guidebook I published to kickstart 2018 with. Go have a read if you haven't already!